In a previous report, the prevalence of a second mesiobuccal (MB2) canal for type 2 (2-1) was found 42% in males and 37% in females; for type 4(2) was found in 29% and 27% males and females, respectively. However, the prevalence of a MB3 canal is infrequent. For type 8 (3), total prevalence in males and females was found 0%, for both additional types XVII (-3-1) and type XVIII (3-1) the total prevalence in males was found 1% and 0% was reported in females. This article discusses the successful nonsurgical endodontic management of permanent maxillary first molar presenting with the anatomical variation of 3 roots and 5 canals (three mesiobuccal, one distobuccal and one palatal canal). A 22 years old male patient was referred to the clinic for the treatment of maxillary left first molar tooth. Patient reported the complaint of pain for the preceding 2 weeks. Clinical examinations revealed a tooth with an amalgam restoration and fistula. Tooth had minor discomfort to percussion and palpation and failed to respond to electric pulp testing. Radiographic examination revealed a radiolucent lesion on the distal aspects of the coronal portion extending toward the pulpal outline [Figure 1]a. Clinical and radiographic examination lead to a diagnosis of asymptomatic apical abscess, indicating the need for endodontic treatment. After the establishing the access cavity, clinical examination of the pulpal floor with an explorer under a magnification of 2.5x, and using magnification loupes presented the anatomy of the tooth as follows: 3 orifices in the MB root, 1 orifice in the disto- buccal root (DB), and 1 orifice in the palatal root (P). MB, DB, palatal roots had Vertucci's additional type XVIII [3-1], type I and type I configurations, respectively. [Figure 1]b. 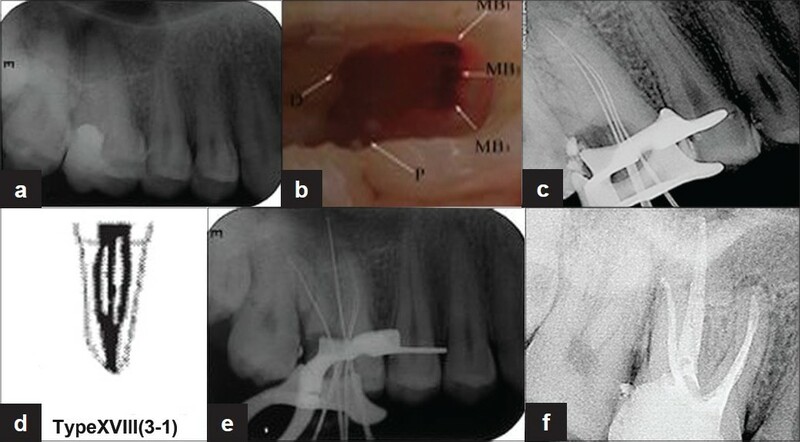 Exploration of the canals with a size 10 ISO K-file revealed that the canals in MB root fused before exit as a single foramen [Figure 1]c-e. All canals were instrumented using crown-down technique under copious irrigation with 2.5% sodium hypochlorite solution and Ethylene Diamine Tetra Acetic acid. The canals were dried with paper point and dressed with calcium hydroxide and sealed with Cavit (ESPE, Seefeld, Germany). One week later, the canals were obturated with gutta-percha and sealer [Figure 1]f. The tooth was restored with full veneer crown, and it was asymptomatic thereafter at 6-month follow-up. This report shows that the clinician must be conscious of anatomic variations during the diagnostic and treatment phases of maxillary first molars, so that correct root-canal therapy can be performed respecting the possible challenges of pulp space anatomy. The frequency of maxillary first molars with 5 root canals especially with three MB canals is rare; however, each case should be investigated carefully, clinically and radiographically, to detect the anatomical anomaly. 1. Sert S, Bayirli GS. Evaluation of the root canal configurations of the mandibular and maxillary permanent teeth by gender in the Turkish population. J Endod 2004;30:391-8. 2. Wolcott J, Ishley D, Kennedy W, Johnson S, Minnich S. Clinical investigation of second mesiobuccal canals in endodontically treated and retreated maxillary molars. J Endod 2002;28:477-9. 3. Cleghorn BM, Christie WH, Dong CC. Root and root canal morphology of the human permanent maxillary first molar: A literature review. J Endod 2006;32:813-21.